Don & I spent July & August 2013 Camp Hosting at Memaloose State Park located on the Columbia River in Oregon – we had agreed to work as Interpretative Hosts at the Park. Campfire talks, Nature Walks, Junior Ranger Programs. Camp Hosts – including interpretative hosts – are volunteers who support parks (or Fish Hatcheries, Historic Sites, Nature Centers, etc.) and stay at the park while perfuming their volunteer duties. Another page at our blog discusses working as an Interpretative Host – that can be found here. Memaloose State Park is in a lovely area of Oregon with lots of hiking, history, wind & kite surfing, nice towns nearby (Hood River, the Dalles) and Portland two hours away. It is a transient park – guests typically stay for one or two nights while traveling to other destinations – if you look at its loction you can understand why. 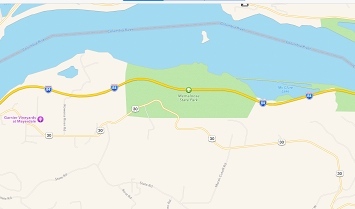 Wedged in between railroad tracks and Interstate 84 it is not a typical State Park. And while it borders the river with a nice white sand beach, no swimming is allowed as the railroad tracks lie between the park and the beach. A few years back – rumor has it – some kids crossed the tracks in front of an oncoming train, causing the train to stop. Which costs the railroad money to reinspect the rails. So no more crossing the railroad tracks. 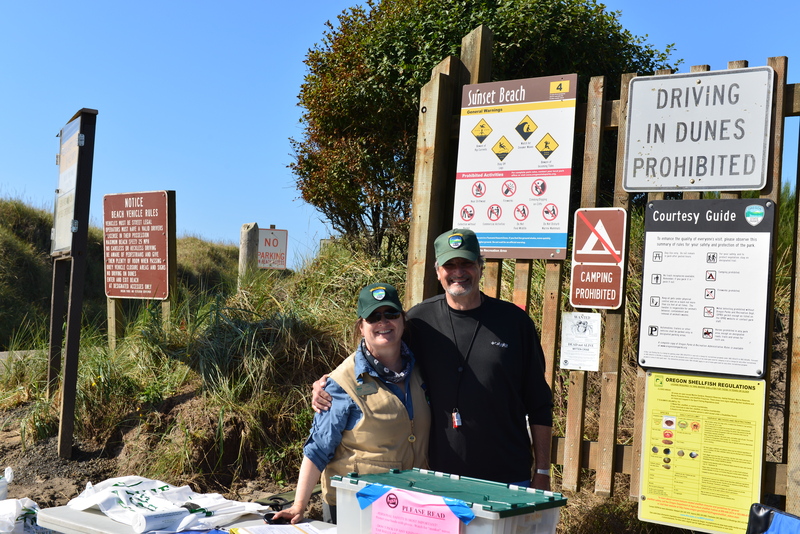 While at the Park and speaking to guests about their plans – where they were traveling to & from – guests consistently mentioned their destination as Fort Stevens State Park and their enjoyment of the park. When asked “why” they said a variety of reasons – from the Coastal location, lots of activities, great bike trails, nice campsites. We had to check it out and see if it was a location good for hosting. We spoke the Fort Stevens Ranger who manages Park Interpretation to arrange a meeting during our visit. We were set and headed out to the Park on our days off. When we arrived we were blown away by the size & efficiency of the park. With over 500 camp sites, making it one of the largest State Parks west of the Mississippi, it has to be well-run, or guest would not return. With a cadre of Rangers to check in guests and Camp Hosts delivering firewood and working various facets of the park, it was great to see a smooth-running operation. We met with a few Rangers, including the Lead Ranger for interpretation and we were suddenly a lock for hosting for 2014. Yeah! We were excited – this is a park that turns away numerous volunteer wanna-bes. Fast-forward to the 2014. We arrived at Fort Stevens after a two month host job at Milo McGiver State Park. A great hosting job. We looked around and wondered how we would fare in the large park. We loved it! The park offers much to explore – with miles of biking/hiking trails, beaches to roam on and historical sites to rummage through, it was a lot of wandering, exploring, biking. Five days a week we typically led morning kayak tours on Coffenbury Lake, an internal lake formed by beach dunes on all sides. Apparently predicted to disappear in ~100 years. Get there soon! Our kayak tours typically involved no more than 11 guests who registered and paid at the Ranger Station – so we did not have to get involved with any paperwork. We were responsible for putting all equipment in place prior to guest arrival. We also gave a short tutorial prior to kayaking regarding technique, proper kayak entry and other safety information. Once on the water, we provided historical and natural science information about the lake and park. We also had a short discussion about kayaking, our kayak experience and selecting a boat should any guest decide they wanted to get more involved with the sport. When not leading kayak tours (which was not easy with much schlepping involved, the easiest part was the kayaking) we led people on a nature hike or a bike photo safari. We especially enjoyed the area. The town of Astoria is great – good restaurants, farmers markets, breweries. Nearby Oysterville is a charming little town with – surprisingly – great oysters. We travelled up there a lot. The town of Seaside is also a nice visit. A special bonus was working with folks who were great fisherman during Salmon season. And camping near people who came specifically to fish the great salmon runs in summer. We were the lucky beneficiary of their generosity. If you should stay late into the Fall, you will harvest many mushrooms as the forest explodes with them after a hard rain! Mushroom hikes are held through the gal. We really enjoyed our time hosting at Fort Stevens and hope to return to the great park in 2016! Should you decide to host at Fort Stevens, suggest you get your application in early. This popular park attracts many applications – and while they have many volunteer positions, they have many more applicants than available slots. Good Luck!